There is no doubt that Parveen Rehman was an extraordinarily brave woman. A trained architect who could have lived a comfortable life in Karachi’s up-market Defence or Clifton areas, she instead chose to dedicate her life to the poor of the squatter settlements of Orangi Town. She was the dearly departed Dr Akhter Hameed Khan’s (a development guru) brightest and as it turned out, bravest, student and with good reason he chose her to continue with his pioneering work in Orangi. Parveen had been working at a private architecture firm before being recruited by Dr Akhter Hameed Khan to become Joint Director of the Orangi Pilot Project back in the early 1980s. She was put in charge of managing the housing and sanitation programmes. In 1988, OPP was split into four organisations, and Parveen Rehman became director of the OPP-RTI (Orangi Pilot Project – Research and Training Institute), managing programmes in education, youth training, water supply and secure housing. In 1999, Dr Akhter Hameed Khan passed away and Parveen remained steadfast in carrying the torch. She would often describe Orangi’s population of 1.5 million people as “a great example of self-help initiatives”. The people of Orangi on a self-help basis (and with technical guidance from the OPP) established modern underground sewer lines and built latrines in their homes. The government only contributed by building the main sewers or nallahs. In Orangi, the people and the government became partners in development. The people of Orangi set up 650 private schools and opened 700 medical clinics, while establishing 40,000 small enterprises in various homes. Around 60 per cent became self-employed. Orangi consists of 113 settlements inhabited by various ethnic groups: Pathans, Balochis, Muhajirs, Biharis, Punjabis etc. It was set up in the 1960s by the government but it expanded very fast in 1981-82 when refugees from former East Pakistan began to settle there. The first sewerage system was built in Hanifabad in Orangi No. 1. “It took us six months to help build the sewerage system in just one lane. But gradually, the replication started,” said M Javed Ali, a manager at the OPP. OPP’s initiative to motivate people to construct proper sanitation system on self-finance basis has been a success as more than a hundred settlements and areas have adopted it in Karachi with the help of the NGO’s technical experts. 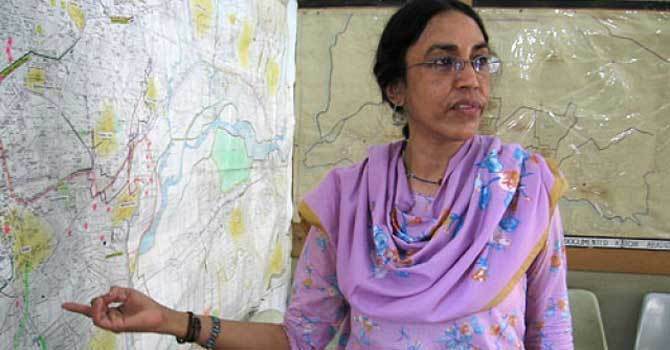 Parveen Rehman had been getting death threats from land grabbing mafias but bravely continued to do her work. She was shot dead in Karachi in March 2013. It is such a matter of shame that we didn’t even let this great lady die her natural death. People like Parveen Rehman don’t come around very often. She was a real gem of the breed who dedicated her life for helping the poor of Orangi Town in Karachi. Hes tragic murder was a great loss for this country. May her soul rest in peace forever. Since WWII, people who occupy free land are commonly known as Jews. Orangi was set up in the 1960s in cap city of Sindh by the government led by military Gen Ziaul Haq. The settlement expanded very fast in 1981-82 when refugees from former East Pakistan began to settle there, like the Jews in Palestine. Sindhi people condemn this ill willed attempt of demographic engineering.